Medallion jacquard center, Greek key chenille sides, and ruched silk at top and bottom. Braid and brush fringe trim. EXCLUSIVELY AT NEIMAN MARCUS Pieced sham with silk sides and braids. Twisted cording finish. Zip closure. Front: silk/polyester. Back: polyester. EXCLUSIVELY AT NEIMAN MARCUS Pieced sham with silk sides and braids. Twisted cording finish. Zip closure. Front: silk/polyester. Back: polyester. Dry clean. 19" x 25". Made in the USA of imported materials. EXCLUSIVELY AT NEIMAN MARCUS Standard sham combines truffle and teal woven medallion brocade with chenille accents, velvet and silk textures, artisan embroidery, and hand-sewn couture details. Dry clean. Medallion center; tassel trim. Made in the USA of imported materials. Plisse-stripe fabric is woven in Europe of cotton/polyester/viscose. Sham has polyester backing and is finished with a crushed silk ruffle. Plisse-stripe fabric is woven in Europe of cotton/polyester/viscose. 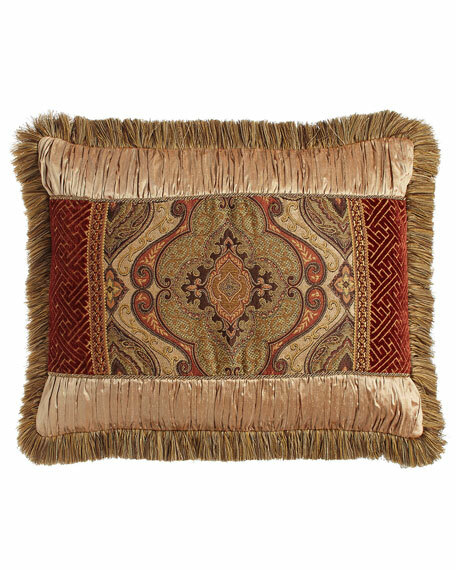 Sham has polyester backing and is finished with a crushed silk ruffle. Dry clean. Made in the USA of imported materials. EXCLUSIVELY AT NEIMAN MARCUS Marble swirl-print pillow. Crushed silk piping finish. Hidden zip closure. 19" x 25". Front, polyester/cotton/silk; back, polyester. Dry clean. Made in the USA of imported materials.